How many of your Twitter followers are fake? I’ve often wondered about that, as I am a firm believer in authenticity, and creating a community of real followers. So I’m kind of liking a new tool released by StatusPeople that allows you to check to see how many followers you have that are fake, inactive and real. You can also check your friends followers! Check it out here – and share how many fakers you have! 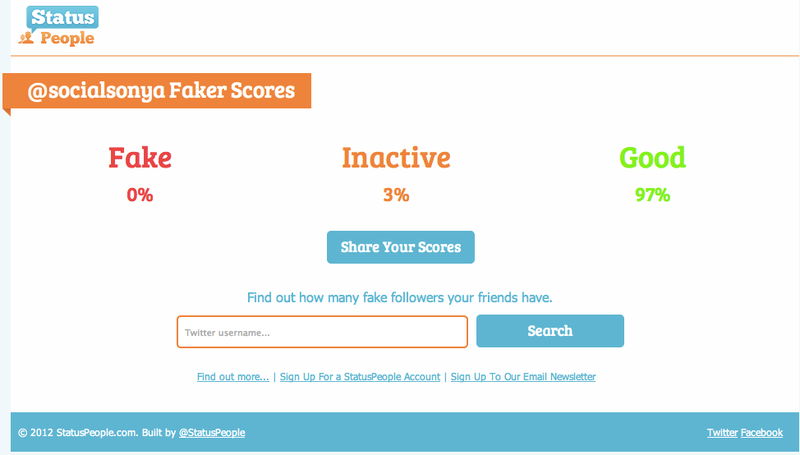 I was happy to see that I have 0% fake followers, 3% inactives, and 97% real followers. Next Post Fake It ‘Til You Make It? Your style is so unique in comparison to other people I have read stuff from. Thanks for posting when you’ve got the opportunity, Guess I will just bookmark this site. Are you using wordpress? If so, there is a simple SEO Plugin you can load.